Protein misfolding and aggregation is the fundamental cause of many amyloidogenic diseases. The deposition of proteins in the form of amyloid fibrils and plaques is the characteristic feature of more than 20 degenerative conditions affecting either the central nervous system or a variety of peripheral tissues. For Alzheimer's disease (AD), the oligomerization of amyloid beta (Aß) to soluble oligomers and their accumulation in the brain are believed to be the primary pathogenic events that lead to synaptic loss and selective neuronal cell death. Therefore, reducing Aß levels in the brain by recruiting the immune system or inhibiting Aß aggregation via agents that interfere with its self-assembly are promising strategies for AD therapy. In this presentation, I will describe our recent efforts in developing surface-modified proteinous microspheres that can selectively bind Aß, enhance its clearance by macrophages and reduce its toxicity. I will also describe the development of novel self-assembled cyclic D,L-a-peptide nano-architectures that interact strongly with A and inhibit its aggregation and toxicity due to their immense structural-functional similarities to that of different amyloids. The in vitro and mechanistic studies of these kinds of peptide architectures will be also discussed. (1) Richman, M.; Wilk, S.; Chemerovski, M.; Warmlander, S. K.; Wahlstrom, A.; Graslund, A.; Rahimipour, S.
In Vitro and Mechanistic Studies of an Anti-Amyloidogenic Self-Assembled Cyclic D,L-a-Peptide Architecture. J. Am. Chem. Soc. 2013, 135, 3474. (2) Richman, M.; Perelman, A.; Gertler, A.; Rahimipour, S.
Effective targeting of abeta to macrophages by sonochemically prepared surface-modified protein microspheres. Biomacromolecules 2013, 14, 110. (3) Richman, M.; Wilk, S.; Skirtenko, N.; Perelman, A.; Rahimipour, S.
Surface-modified protein microspheres capture amyloid-beta and inhibit its aggregation and toxicity. Chem. Eur. J. 2011, 17, 11171. He did his PhD thesis work in the Department of Organic Chemistry and Neurobiology, at the Weizmann Institute of Science, Israel and he was graduated in 2001. During his second post-doc at the Scripps Research Institute in California (2003-20006),he worked on Self-assembled cyclic D,L-a-peptide and cyclic D,L-a-glycopeptides nanotubes as antibacterial and anticancer agents. 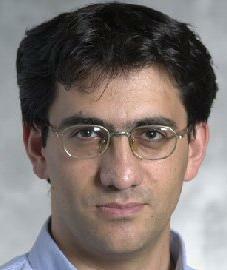 In 2006, he became a Senior Lecturer in Bar-Ilan University's Department of Chemistry.